You can specify the color and size of the border with the variables borderWidth and borderColor. Like you put photos in an album, you can also put resources in a collection. A collection can be related to a certain event, a topic, whatever you like. To create such a collection, simply click on My Collections. You can add resources to and remove resources from collections on the respective resource detail page by clicking on the link Add to Collection. Collections are public now: When a resource is part of a collection, this information is displayed in the the right column of the respective resource detail page, and people can see what other resources are part of this collection - of course respecting the visibility of the resources, i.e., you can of course have resources with restricted visibility in your collections, they can only be accessed by yourself or the users in the respective closed groups. Edit collections: For every collection that you find on the My Collections page, you will now find a link Edit. There, you can edit the title and description of a collection, and you can also delete it. Easy removing of resources from collections: When you look at the list of resources inside your collections, you will now see a new link Remove from Collection under each resource description. Remove resources from a group: In group resource search results and the list of all group resources, you now find a new button Remove from Group under each resource description (similar to the one that allows to remove resources from a collection). You can also do this now in a more convenient way on the detail page of a resource - we added a respective link for group administrators in the right column where the groups are shown. Delete a group: On the group administration page, you now also find a button I want to delete this group. We recommend that before deleting a group, you first send a message to the group members and tell them that they have the possibility to export the group resources by using Export Resources (some more information about this functionality in the next post). When you delete a group, ALOE will send a message to all members to inform them that the group has been deleted. Important: If you delete a closed group, all group resources with visibility ‘group’ as well as the annotations for them (tags, comments, ratings etc.) will be deleted from the system! Finally, we also added some new sort criteria for group lists: We now offer to sort groups by Alphabet, Date, Number of Members and Number of Resources. In the last post, I wrote about the feeds that we now offer in ALOE. Bringing information to users in a convenient way is an important issue - but what about users that don’t like feeds, and what about information that is not publicly available, but only in closed groups? Well, you already know the answer: For these scenarios, we offer several email reports you can subscribe to! Once you are member of a group, you can subscribe to daily or weekly group activity reports. This is offered on the respective group overview page, and you can also see all your subscriptions on the page My Preferences. By the way - after several discussions with our early adopters, we decided not to send any information in daily reports when nothing happened in a group, and we also decided to aggregate the information of several reports into just one email. We hope that this feature is useful for you, and we’re of course open for any feedback and suggestions! New features - feeds, feeds, feeds! Feed for activities on your resources: This feed provides information about all activities on your resources. See who commented on stuff, see who added something to his/her portfolio, etc. You find the feed URL on the page My Resources or under your buddy icon on the page My Profile. User resource feed: Do you like the contributions of certain users? You can get information about new public resources of a user by subscribing to this feed. You find the URL under the buddy icon of the respective user’s profile page. Group activities feed: All public activities related to the group (e.g., ‘join’ or ‘unsubscribe’) and group resources (e.g., when someone commented on a group resource) will be show here. You can find the feed URL on the new overview page for the respective group. Resource search feed: If your are interested in new resources matching a certain search criterion, you can simply subscribe to the respective feed! Simply do the search that you like, and you’ll find a little feed icon in the upper right corner (close to the Sort Criterion Selector). What is very important: Of course we respect your privacy! Nobody can see when a resource was viewed, and also rating information will always be anonymous. Only information that a user without login could also see will be provided. Thus, we also don’t offer any feeds for closed groups. But you can still follow what’s going on with our new email reports - these will be covered in the next post, stay tuned! A lot has happened in the recent months, I guess it’s also time to talk about some of the news! So in the coming posts, I’ll introduce some new ALOE features and write about diverse improvements. I’ll start with a feature that was essential for me: the parallel upload of bookmarks to other platforms. I’m using social bookmarking systems (especially Diigo and Delicious) for a long time. First of all, because these tools are great and really helpful if I can access my bookmarks wherever I am and whatever computer I use. Secondly, because this offers the chance to exchange information with friends and colleagues that also use these platforms. So although I like ALOE a lot (hey, it’s my baby), I still don’t want to miss the other systems. So I’m happy when I can use ALOE, but simultaneously add the respective information to my other social bookmarking systems with no extra effort. This is extra nice when you use a closed version of ALOE that is not visible for everyone. E.g., here in the Knowledge Management Department of DFKI, our group uses an ALOE instance (we call it ALOE@KM) which is not accessible from outside DFKI. We use it to share a variety of stuff, sometimes about research, science, and technology, and sometimes (I guess even more often) about fun stuff (wait, of course research, science and technology can also be fun stuff!) When I want to share stuff that should not be visible to anyone else, this is fine. But when it’s a public content that I also want to share with my colleagues, I don’t want to contribute the stuff twice. So now I can simply click the bookmarklet and decide if I also want to upload it to other systems (including the public ALOE!). As you see, you can also decide to have an automatic status update in Twitter whenever you add a new bookmark! To have full control of what you do (e.g., when you want to distinguish between internal and external resources), you always can unselect chosen services when adding a bookmark. And of course you will be notified when something didn’t work - it would be nasty to find out later that all the stuff you thought would also be available on your selected bookmarking services didn’t arrive! I hope you enjoy this functionality as much as I do! And if you want us to add other services (by the way, we already integrated BibSonomy in our KM instance of ALOE, but have to do some fine-tuning first) - simply send an email, we’ll check what we can do. My Tags allows you to manage your tags. Group membership is now shown on the resource detail pages. Group admins can resign resources from a group. New feeds for activities in groups, on your resources, and about a user’s new resources. The new advanced search offers a lot of filtering capabilities. Resource detail page: In the right column, you now can see to which groups the resource already had been shared to. This of course excludes closed groups where you are not a member! 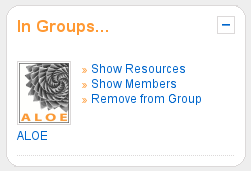 In the menu ‘Share to group’, you now can also see to which groups the resource already had been shared to. Furthermore, you can now resign resources from a group, when you are the group admin. Otherwise, the checkbox will be disabled. 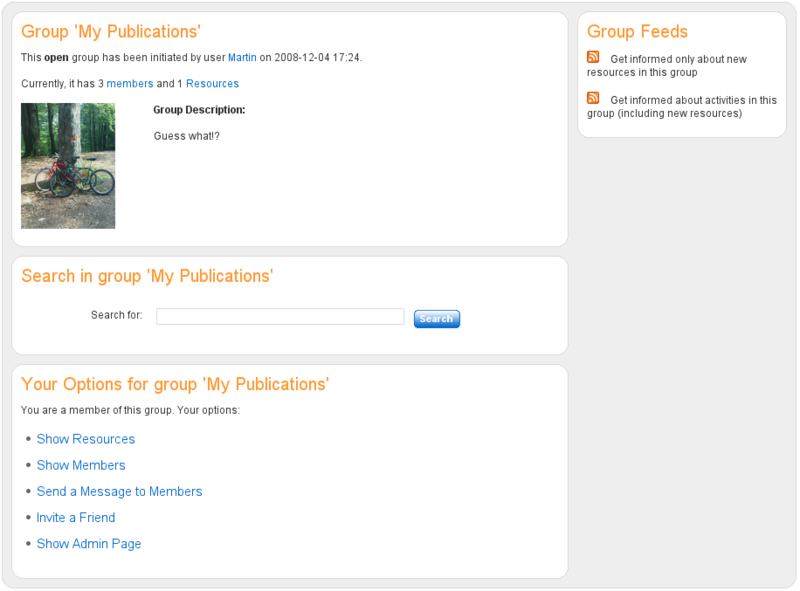 Groups: Until now, clicking on a group’s title always led to the group resources. This has changed: the title now links to the new overview page for the group. Of course you can still get to the group resources, using the link “Show Resources”. Furthermore, you can now also search for resources within groups, and you can invite others to join a group by clicking “Invite a Friend”. Feed for activities on your resources: This feed provides information about all activities on resources that you find in “My Resources”. You find the feed URL on the page “My Resources” or under your buddy icon on the page “My Profile”. User resource feed: You can get information about new public resources of a user by subscribing to this feed. You find the URL under the buddy icon of the respective user’s profile page. IMPORTANT: Of course we respect your privacy! Nobody can see when a resource was viewed, and also ratings will be anonymous. Only information that a user without login could also see will be provided. This also means that we can’t offer any feeds for closed groups. We work on this topic and will soon also provide reports in a different way. Explore Members: Explore -> Members now directly leads to the ALOE users. 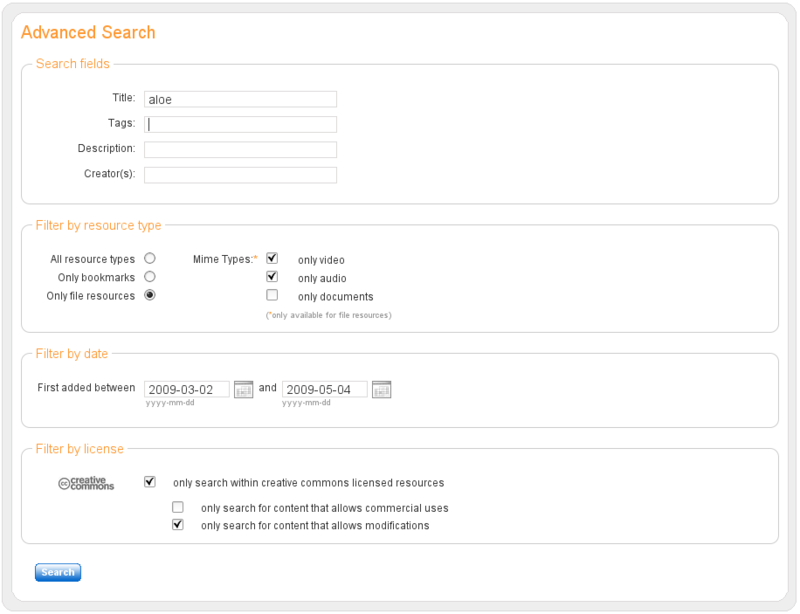 Search fields: Different search terms can be used for different fields (e.g., title, tags, creator, description). Filter by resource type: You can restrict your search to bookmark resources or file resources with specific mime types (e.g., audio, video, documents). Filter by date: Choose a certain period of time for the date the resources were first added. Filter by license: Only search within creative commons licensed resources, or even more specific, within contents that may be commercially used and/or modified. And of course we VERY MUCH appreciate your feedback!! To continue with the SOAP::Lite issues mentioned in the last posting: the problem is solved. My recommendation: NEVER EVER use ‘encoding “utf8″‘ when you want to deal with utf8. Instead, use ‘Encode’ and convert all the strings manually. Tsssss, perl and unicode don’t go well together. Anyway, the batch upload is now working, we’ll clean up the stuff and then provide it to everyone who is interested! 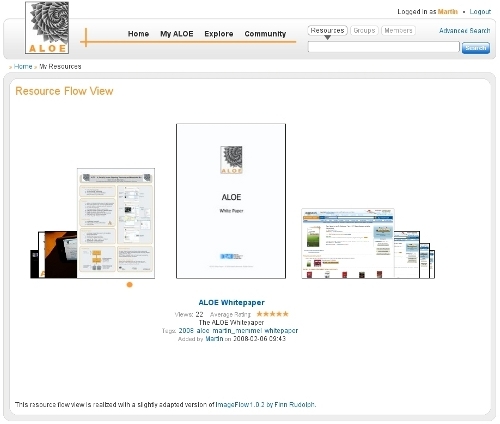 After the maybe useless but funny spherical tag cloud introduced last week, we are proud to have yet another fancy and interactive eyecatcher in ALOE: The “Resource Flow View”. This view was realized with a slightly adapted version of ImageFlow 1.0.2 by Finn Rudolph. It won’t load images dynamically during navigating, so it loads all thumbnails in advance - this might take a while. We’re still experimenting a little bit with this stuff, so it’s not offered as a menu item in ALOE. To see it, you have to add the parameter “viewMode=flow” on any page where resources of a certain user are shown (this also includes “MyResources”). Last but not least, we found some bugs in our Live System that we should fix pretty fast. E.g., changing the sort order for results can result in strange behaviour, because certain parameters just disappear… Depending on how long this will take, the release of the new OPENEER might be a bit later than expected. 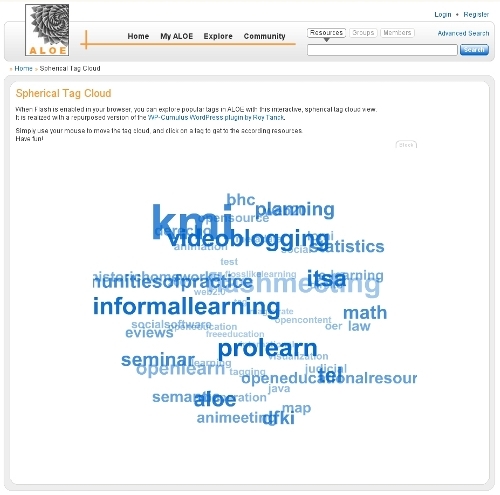 Procrastination is of course bad when trying to finish a PhD, but it’s good when it’s about new features for ALOE So we now have a nice, fancy and interactive “spherical tag cloud” to display popular tags in ALOE. I’m not sure whether it’s really useful, but who cares, it’s fun and it’s definitely an eye-cather! The spherical tag cloud was realized with a repurposed version of the great WP-Cumulus WordPress plugin by Roy Tanck - check out his blog for more information on how to repurpose his code. Furthermore, we’ve put a lot of effort in the creation of an install script that allows to deploy instances of ALOE in a more convenient way. Setting up the different components and setting the parameters manually was always quite a lot of work. It runs smooth now, so the updated OPENEER instance should be available this week! What we also did was to create a small tool that allows for the batch contribution of resources defined via bibtex (or, to be more precise: via BibTeXML that was created with the JabRef reference manager). It’s done with our perl SOAP client, and once we found out why SOAP::Lite doesn’t want work with parameters defined in UTF-8 (everything works fine until you dare to use something like an “ä” or “ü”), we’ll be really happy. Hints are VERY MUCH welcome! Alas, it is done now. After lots of work in the last months, we today released the new ALOE! All data from the old system was copied to the new one, so don’t worry, nothing is lost. We’ve sent an email to all ALOE users with according information. When everything runs smooth now, we’ll also move the other ALOE instances such as OPENEER very soon! The Web Interface got a redesign. Enhanced navigation and sorting possibilities for several lists (e.g., MyResources ). The login is now the nickname and no longer the email address. We added a “Forgot your password?” functionality. 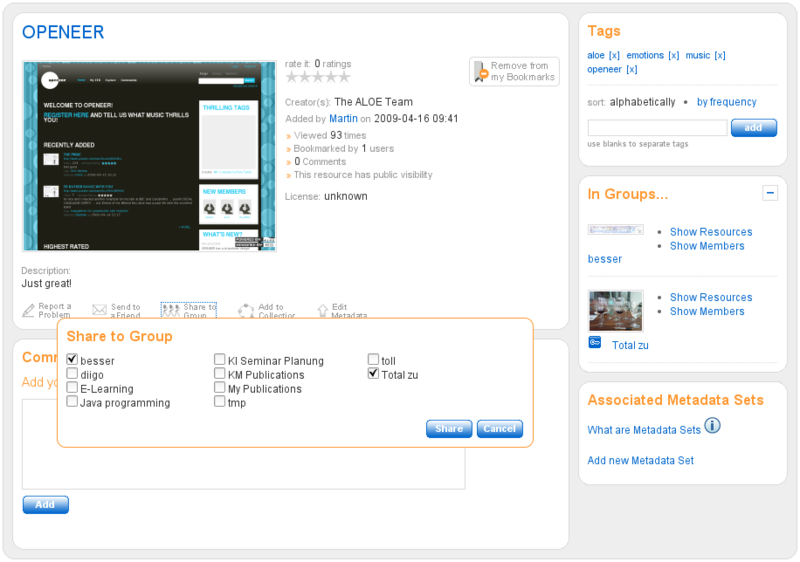 Atom Feeds are provided for any open group in ALOE. Messages to groups can be sent. A bookmarklet to add new bookmarks to ALOE is now available. ALOE provides a message sentbox, and ALOE messages can optionally be forwarded to your email account. 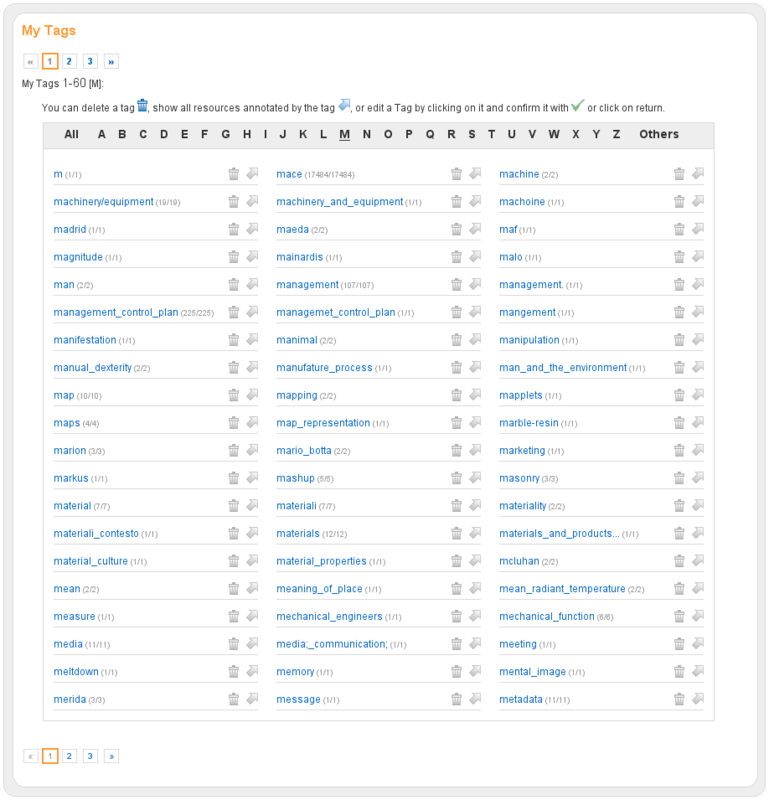 The new ALOE Web Service stores resources, user-defined metadata sets and metadata about the resources in a MySQL data base. That way fine grained access control to the data which is stored in the system can be guaranteed. ALOE has a new JSP interface which allows URI driven navigation. The implementation is performed according to the J2EE Pattern FrontController in combination with the Action Pattern in order to make the component easy to maintain and simple to extend. Ajax functionality is integrated using the well-tried Action/FrontController pattern combination as well. Many functionalities are implemented using the taglib library in order to avoid code replication. This also comes in handy for the server side components of Ajax functionality, where responses consisting of HTML snippets can reuse the code inside the classes of the taglib library. We did our best to protect the platform against code injection or cross-site-scripting (xss). Most parts of AloeView make consequent use of the formatting tag library to enable instances of the system in different languages (or even language switching at runtime later on). Multi-language support is not perfect yet, since there are some known (and definitely several unknown) code snippets, where text was directly inserted into the pages. Nevertheless most of the functionality can be switched to a new language by simply translating one text file. The AloeView system validates as XHTML 1.0 Strict, although there might be some system states, where pages do not validate in all cases. It is simply impossible to check all possible combinations of database states (e.g. empty resource sets), so it is likely that validation will fail in some (rare) cases. Additionally it might happen of course, that new errors are inserted into the system since it is work in progress, but we will keep an eye on it and will do our best to guarantee standard compliance. We do not longer rely on an external thumbnailer for web pages. Instead we are using our own thumbnailer based on khtml2png. There is still some trouble (e.g., with flash content and when adding a bookmark that points to a pdf or jpeg), but we’re working on this. Improved interface in particular for JAVA clients. For such clients many methods return beans so that a confusion of return parameters can be avoided. The business logic is encapulated in a seperate layer in order to enhance the extensibility of the system. Encapsulation of the data base access in dedicated classes so that the exchange of the persistance layer will be eased for future scenarios. Of course we are always happy about your feedback! Tell us when something is not working, when you’re missing something, when you don’t like certain features etc. Of course, we’re also happy when you tell us that you like the new ALOE Have fun! How much bad luck can you have!? You’re running the system on the same server for months. Nothing ever happened. You are testing your code. Extensively. Then you launch.